* All rebates applied advertised pricing is on in-stock units only and includes all applicable dealer discounts, manufacturer discounts, and incentives. 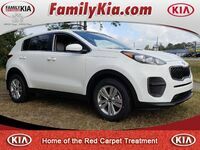 Family Price requires approved credit Financing through KIA Motor Finance and excludes dealer fee of $699, tax, tag, title, and electronic filing fee; as well as, dealer installed options which is the $1,799 Vehicle Protection Package (includes: Service Car Washes, Custom Pinstriping, Mud Guards, and Smart Shield Protection Treatment.) Not all customers will qualify. A copy of the advertisement must be presented at time of purchase to receive any special or advertised price. Prior sales are excluded. Cannot be combined with other offers. We attempt to update this inventory regularly; however, there can be a lag between the sale of a vehicle and the updating of inventory. Please contact us to verify availability.